We managed to spend a few precious minutes with the upcoming BlackBerry Bold Touch 9900 in New York City. The handset is one of the most anticipated launches this year, and has generated a lot of buzz. Here is our early impression on it. BlackBerry phones have always been well known for their solid build quality and the Bold Touch is no exception. The thinnest BlackBerry yet feels pleasant when held in hand and impresses with premium materials. The bezel which goes around the phone is made from stainless steel and the faux leather from the previous generation of BlackBerry Bold handsets has given way to the fashionable carbon fiber. The BlackBerry QWERTY keyboard, which has become an industry benchmark, has not changed dramatically as well and this is definitely a good thing. Now on with the screen. The 2.8-inch capacitive touchscreen with a VGA resolution and 287 ppi density is a pleasure to look at. Its touch functionality however is a bit questionable due to its small size. The BlackBerry OS 7 does not strike us as optimized for touch implementation. Actually, it doesn’t look any different than the UI of the current BlackBerry Bold devices save for the more colorful icons. Knowing that it is a transitional UI, it would have been better to carry the OS 6.5 name for example. 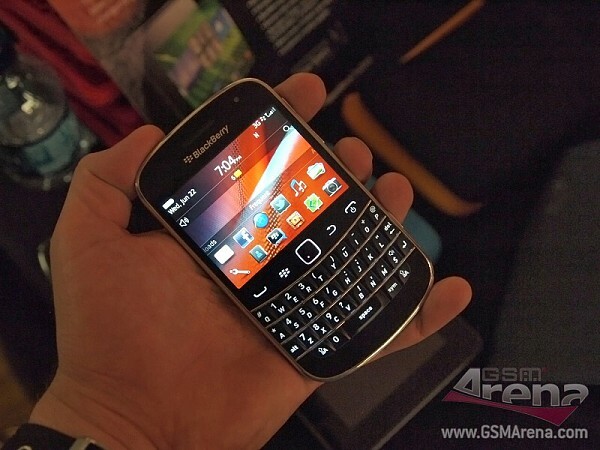 Overall, we left the BlackBerry Bold Touch with mixed feelings. It solid build quality and premium materials make it a joy to hold. In terms of OS and touch screen implementation however, there is a lot more to be desired. We are sure that the die hard fans of the brand will welcome the latest addition to the BlackBerry family, but winning new customers will probably be a long shot in today’s highly competitive market.